This Sunday we continue our series “The Apostles Tale” that parallels the Apostle Paul’s letter to the church of Rome alongside Margaret Atwood’s novel, “The Handmaid’s Tale” – a disturbingly dystopian vision of religion and power gone toxic in America. 26In the same way, the Spirit comes to help our weakness. We don’t know what we should pray, but the Spirit himself pleads our case with unexpressed groans. 27The one who searches hearts knows how the Spirit thinks, because he pleads for the saints, consistent with God’s will. The Spirit of God intercedes on our behalf, even when we can’t put our feelings into coherent words to pray aloud. The Spirit intercedes on our behalf to help us discern what we ought to do to bring an end of suffering to those who suffer as Christ suffered. In this way the Spirit gives voice to our groans, and sustains our hope in Christ. The Spirit gives us hope that our work is not done in vain, rather our work is an expression of Christ’s love. And no one can separate any of God’s children from the love of Christ. Think about a time when you prayed and didn’t know exactly how to express what was on your heart. In reflecting on this passage in Romans 8, does Paul’s description of a groaning prayer seem consistent with your own experience in prayer? If not, why not, and if so, how? Think about a time when someone interceded on your behalf for something. As best as you can, place yourself in the emotional state you were in when you discovered that they were interceding on your behalf. If you could write a letter to this person expressing your feelings about what they did, what would it say? Pastor Christopher paralleled the idea of intercession – the Spirit praying on our behalf – alongside the responsibility to help ease the suffering in the world. 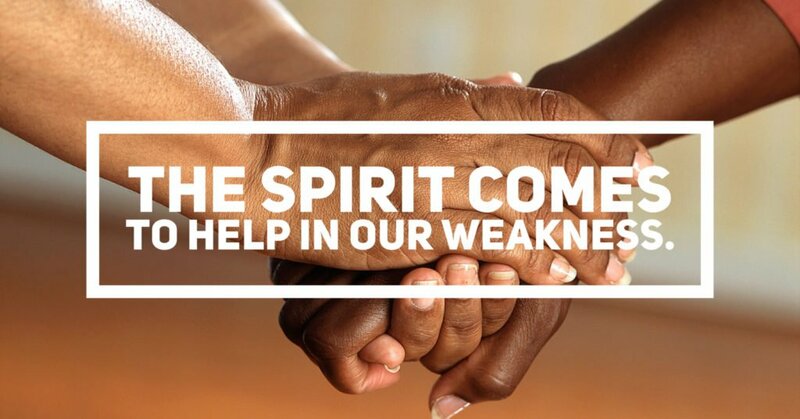 He also noted that sometimes we have trouble asking for help when we are in need, and that the Holy Spirit might bring comfort and peace when we face the fear that keeps us from seeking aid. Is there a time you can think of that you were in need of help or support but were unable or unwilling to ask? Why? What prevented you from asking? Did you eventually seek help, either in prayer or by asking others? What finally convinced you to do so? Did you receive help? Assuming so, how did it feel to be given the help that was sought?